http://www.microsoft.com/downloads/details.aspx?FamilyID=82243606-d16d-445c-8949-9ee8c10cda2e%26DisplayLang=en to download the CTP. http://connect.microsoft.com/VisualStudio/ to report bugs or issues with the CTP including STL/CLR. 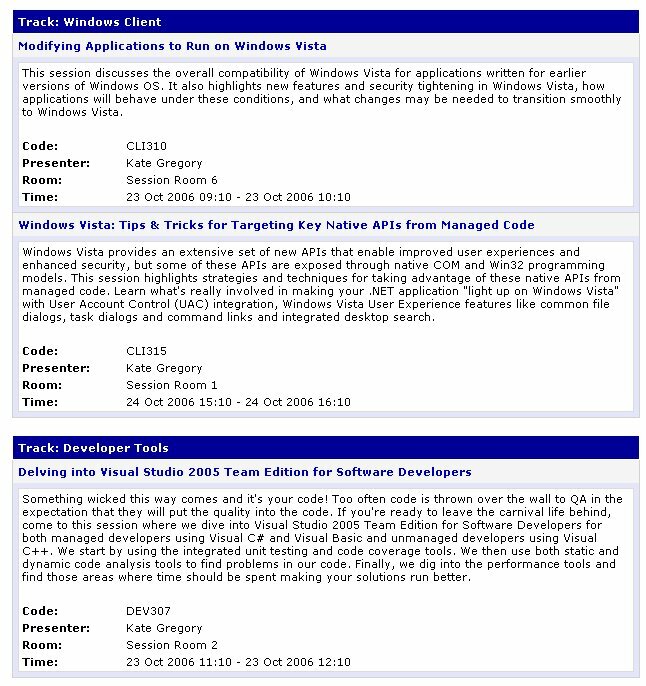 http://blogs.msdn.com/vcblog/archive/2006/09/30/777835.aspx Known issues and some workarounds. So many paying projects to finish... but I will get working with this soon. Time to adjust my November talks to stop using the old unofficial version and start using the CTP version. It weighs less than a pound and when it's in its stuff sack, I bet it would fit in a roomy jacket pocket. 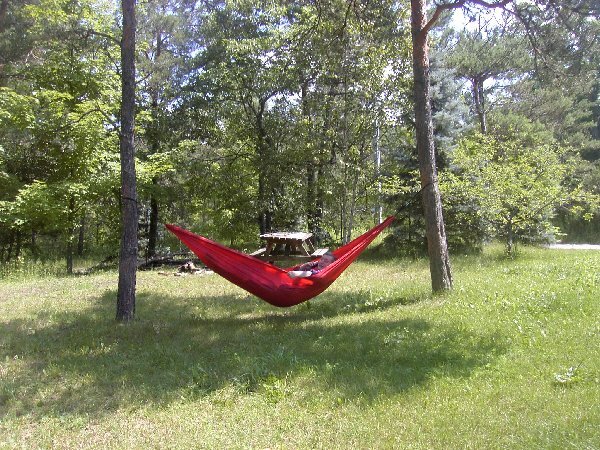 It certainly takes up less room in a beach bag than a towel, and it adjusts to handle trees of varying distances apart. It came from Lee Valley, where so much of my money has gone over the years. They'll ship anywhere. If you decide you want a Lee Valley catalog, drop me an email. I'll refer you to them and the company will give some money to charity. It compares "empathizing quotient" with "systemizing quotient" -- the extent to which you connect to others' emotions and the extent to which you like to categorize things and people, and fit them into your system of understanding. (This is just for one sample of people and doesn't necessarily apply to the entire world.) You can score very high in both, or very low in both, but as this graph shows, women tend to have higher EQ and men tend to have higher SQ, though the difference between the groups is less than a typical difference between individuals. Engineers and scientists tend to have much higher SQ and also lower EQ. The green symbols on this graph are results from people with Aspergers, or people diagnosed as High Functioning Autistic. Their SQ varies but their EQ is very low. You can take the test yourself if you like. I was surprised by questions like "When I read something, I always notice whether it is grammatically correct" -- that is 100% true of me but I thought it was my little quirk, not something that would appear on a test for personality traits. Then there was "Whenever I run out of something at home, I always add it to a shopping list." Who doesn't? My results are perfectly ordinary for someone with a PhD in engineering, I think: EQ 36, SQ 77. That puts me about where the S is in the "extreme S" label. Interesting. Folks I've seen speak here before, for the most part. This is always a very enjoyable conference for me and I'm looking forward to seeing everyone again. RDs, blogs I read, MS people... it's going to be a great time! Shankar Vaidyanathan, who's been on the VC++ team for over 12 years, talked to Channel 9 in late July about why C++ devs actually do use and care about the IDE. He also shares some of the challenges for writing an IDE for very demanding customers. Watch this one immediately after the Boris one and you'll be an IDE guru! I don't know why I didn't see this earlier, but then again I had a tough summer. Here is Boris talking about the C++ IDE and a lot of the tips that were in my Tech Ed IDE talk ... the one with no slides. If you weren't at my talk then I guarantee you will learn something about VC++ from this video, and even if you were, you still might. Update: I really should have included this link to Boris' blog. Maybe he will update it more often if he gets more traffic. When it's all working, and every time you touch it from then on, look it over to see if you can make it simpler. That last one is the one so many people seem to skip. Then later when I come along and read the code, I see how it could be simpler, but I hesitate to change it. They must have done it this complicated way for a reason, I think to myself. It can take quite a long time to prove to myself that no, they just settled for 'working' and ran away as fast as they could, leaving this mess for someone else to sort out later. Make your code look like other people's code. Use the simplest design possible. There are no false notes in this list and I endorse this set of philosphies whole-heartedly.